The Delta King Hotel in Old Sacramento is a unique Sacramento treasure. 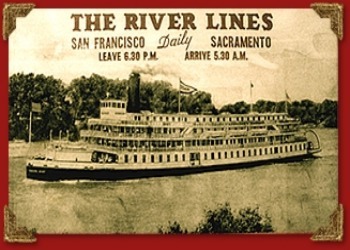 The authentic riverboat plied the Sacramento River between San Francisco and Sacramento from 1927 to 1940. During World War II it served as a troop transport on San Francisco Bay. 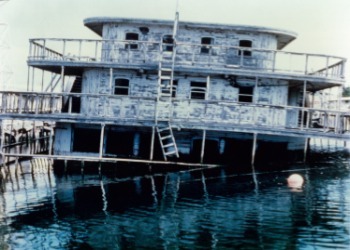 After the war the Delta King became a derelict roaming the Delta, without purpose or home. It sank at Richmond in San Francisco Bay in 1982 for a period of 18 months. 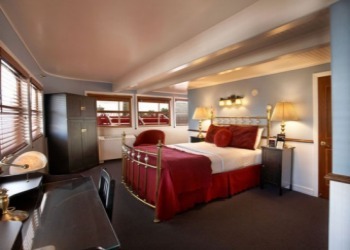 In 1984 the Delta King was brought to Sacramento where it underwent an extraordinary renovation at a cost of $9 million. Today it is a beautiful floating hotel with modern lodging amenities, 2 acclaimed restaurants offering casual and fine dining, 2 professional theaters, a wine school and exceptional facilities for weddings and meetings. The Delta King is the best of the old world and the new. Experience old world charm and service complimented by modern amenities and acclaimed cuisine. In early 1984 my brother Ed Coyne walked into my San Rafael law office and suggested we make a modest investment in the historic riverboat Delta King. I had never heard of the Delta King. Ed described the famous vessel and its storied history on the Sacramento River. He elaborated on the striking white super-structure, particularly as contrasted with the maraschino cherry red of the churning paddle wheel. He referenced the beloved, identical sister ship, the Delta Queen, which was famously operating out of New Orleans on the Mississippi River. Ed spoke of the 14 years that the Delta King and the Delta Queen commuted between San Francisco and Sacramento from 1927 to 1940 and their role in World War II. In short order my 3 brothers and sister and I agreed to invest in the glorious Delta King. The boat we purchased was not quite as described. The Delta King is an authentic 285-foot riverboat that was originally built in Glasgow, Scotland and Stockton, California. The King and her identical twin, the Delta Queen, were christened on May 20, 1927, and began their daily river voyages between San Francisco and Sacramento in June of that year. At 6:00 p.m. each evening, the grand monarchs of the Delta left their docks for the 10 � hour trip that included prohibition era drinking, jazz bands, gambling and fine dining. A stateroom was $3.50, but for a dollar and "�your own blanket" the night could be spent on the Cargo Deck. At the conclusion of the War, the Delta Queen was purchased by the Green Line Steamers of Cincinnati and taken, via the Panama Canal, to the Mississippi River where she served as the flagship of the Delta Queen Steamboat Company. When the Queen left for the east, she took the engines from the Delta King for spare parts. The Delta King has been towed everywhere it has gone since then. In 2008 the United States Congress declined to extend the exemption for the Delta Queen to provide overnight passenger service. (Current regulations do not allow overnight passage of vessels with wood superstructures.) The Queen is now in Chattanooga Tennessee with plans to operate as a land side hotel and entertainment facility, much like the Delta King does currently. After the war, the King was ingloriously shuttled between Canada and California as a derelict with hopes of becoming a floating Ghirardelli Square or Chinese Restaurant dashed by sinkings and litigations. At one time the Delta King was a landlocked barrack in Kitamet Canada, used by men working in the nearby mines. The original 88 staterooms now number 44 larger rooms. Delta Bar and Grill- Irish Thursday Nights with �Stout Rebellion�, Live entertainment on the weekends. The most frequently asked question about the Delta King is how much of the original woodwork were we able to preserve. The answer is �quite a bit�. If you look closely at the beautiful woodwork in the Delta Bar and Grill and in The Pilothouse, you can discern what is old and what is new. There is a subtle but distinct difference. Not all the old wood went back into its original position, but it was preserved, rejuvenated and used whenever possible. Initially, we had partners in architect Walter Harvey, since deceased, and his wife Joanna. Walter insisted on using the original wood, at considerable additional expense, often over objection. Walter was right.